As you can imagine, I'm still a lil' shaken up since the poop in the cereal incident. Before that, the gecko drama had been slowly building for a while, but that day sort of sealed the deal. I no longer think that these creatures are cute or endearing of any sort. What I didn't tell you last week was that something tragic happened at our home a few days after the "incident". I've been holding it back out of fear of judgment and PETA coming to bust down our door. But I think it's time I opened up about it. And it was ugly. I didn't take pictures because it was a grizzly scene. And ya know what? The story goes as such: Remember the guy that lived in Aaron's bathroom? Well, I can't be positively sure if it was him, but it looked a lot like him. I went into Aaron's bathroom while he was still gone to do some tidying up so that I could improve my running in the Wife of the Year category (not really, but it sounds nice). As I entered the bathroom, that creature jumped out of his hiding spot under the window trim and scared the frickin' crap out of me. Because this happened like two days after the Poop Loop incident (thank you Gordon for coining that phrase for us), I was a little high on rage. Basically, I'd just had enough. I'd had enough fear, poop, reptiles, and crawly things that whole week. I was done. So I started throwing Aaron's size US 14 shoes at him. I managed to knock him off the wall and do little else but scare him really well. But that just wasn't enough for me. I retrieved more shoes and kept chucking them at the little Geico mascot. Finally, five shoes later, I grazed his side and immobilized him. That is when the rage came to a head. I took Aaron's big military, steel-toed work boot and slammed it down on him. But revenge is a dish best served cold. It's all fun and games until someone eats a bowl of poop. Am I right? So anyways, after that day I thought that I'd feel better and things would calm down around here. The geckos had other plans. Apparently their threshold for revenge is much larger than my own. I don't know what happened when I crushed that reptile two weeks ago, but I can only guess that his whole family heard his little gecko screams that night. 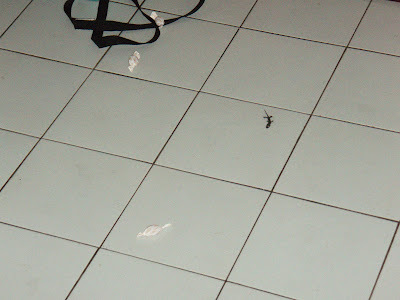 Since that day, I've found three new geckos inside our house. A record, even for us. It's made my gecko disdain into what is now becoming an obsession. I can't let it go either. Whenever I find one now, I stalk it, photograph it and dispose of it. Like I said, I'm done with them. Did you notice the Satanic glowing eyes? I did too. 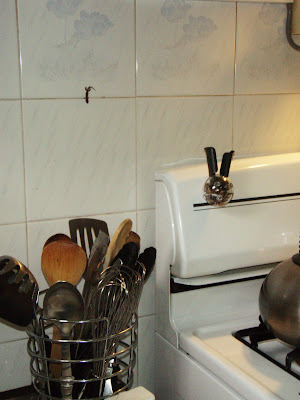 Location found: The backsplash in the kitchen. Location found: Scaling the living room wall. Current residence: He is injured and hiding under my couch as I type. I knocked him off the ceiling with a broom and magically, the fall somehow did not kill him. The bugger scurried under the furniture before my broom could squash him. It's a very frustrating battle I'm faced with. I just told Aaron the whole sordid tale of my latest conquest and he was not at all willing to help. He just shook his head and said, "You are a forest fire." You know what? I like that. I'm going to adopt that mantra for my life in general. OK, so I came across your blog from a comment on the much debated Mrs. G post and read that you were in a Muslim country. The crazy thing is that I grew up in Singapore and then went back there for 3 years in high school while my parents lived in the US. Anyway, in discussions, I find myself constantly referencing Singapore as the "right" way to do things and how happy the citizens really are to live there. Your Gecko story totally cracked me up and brought back many memories. I went to highschool on Thompson road but the campus is now gone. Someday I hope to bring my family back to visit and relive all the memories. Have you eaten at the "banana leaf" restaurant. I think it's called Komala Villas or something like that. It's a most excellent and renown hole in the wall! Blessings on your life there and I'm looking forward to following you in blogland! Hahaha...you made me laugh really hard. You just remind me so much of my girl. At 22, she's still afraid of darkness, lizards and cockroaches. Oh Sis.....this made me LOL and cringe. Only 2 more months of killing geckos sweet girl. Hey! What about a mouse trap, or those sticky pads? Hey, I have recently started following your blog as we are planning a move from US to Singapore and this Gecko thing scares me. We have a 4 year old. How common are the Geckos ? Is it more to do with the jungle behind your home or are they everywhere....YUCK!!!!! I had one actually touch me two nights ago; it fell on my foot when I opened my fridge. It. Felt. DISGUSTING. And kinda wet. 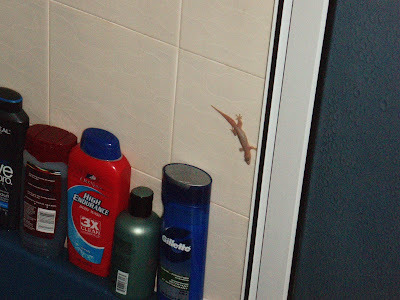 I'm usually alright with lizards, whenever I see one, I let it go, since it'll probably end up feasting on the mozzies. But the black ones are just gross. Guess what color my new friend was. Anyway, mybe you should get some lizard traps, the kind you can find at most DIY stores & supermarkets; they use glue if I'm not wrong, so I doubt they'd be of any harm to you. Yikes! Geckos. 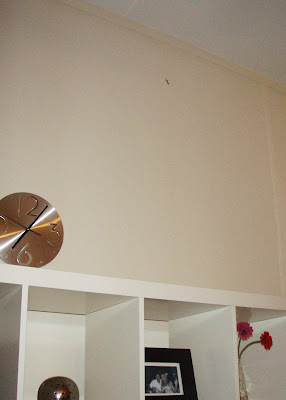 I found a cockroach in my boyfriends apartment the other day and FLIPPED OUT. he called me irrational - I call it preservation. You probably won't be able to find them in supermarkets like cold storage. NTUC (otherwise known as Fairprice) or Giant probably will stock them. You can check around. You see, I'm an herpetologist. In my herpetological opinion, the best you can do is to get more comfortable with them little icky things. This may sound ridiculous, but here it goes: grab a live one, cold turkey. Get someone you trust to put a live one in your hand. Spend some minutes with it, then chuck it away. That will make you feel better when facing the geckos. More importantly, it'll make your killing rate go through the roof. It's so much easier to crush things that, while unpleasant, don't make you cringe. You may even spare some, or leave them for later. Whatever. Herpeto-*logist*, not -fan nor -philiac. Keep them afraid and worried, move yourself to the 'meh' stage. Can I use my EZ Link card, like you said, please?